The secret, if you need a secret, of absolutely everything is to quite simply, love yourself, exactly as you are. Nothing to change. Nothing to work on. When Loving yourself is your mission, within each moment, no matter what anyone says or shares with you – – you understand it for what it is – merely information that is being delivered and up for your consideration. Not to derail you, or to take on as truth, but merely as information outside of your self. When you love yourself, you have a clear boundary around remembering the truth, ‘what other people think of you is none of your business’ and your only job today and every day is to love yourself and wash whatever comes your way with that loving energy which understands intuitively you are more than enough…. How often are we caught up in giving someone some advice on how they could be instead of embracing who they are? Instead of extending acceptance for where they are and who and what they do. The greatest power you have to change a situation or circumstance is in direct correlation to your level of accepting it exactly as it is without trying to change anything, offering a new vision of possibility for them to rise into with compassion for the total person. You can’t change what you haven’t realized so in giving the gift of acceptance, you enable undefended loving vision, allowing the person to grow beyond what they were attached to, to what they believe about themselves, unhinging the world into limitless possibility just by being present to who they are with love. So thank you God for making you. Thank you God for making them. Life is an ever unfolding gift when you are willing to remember everything begins when you stop the chaos of your thinking and stay present. From that space of love watch how everything happens. 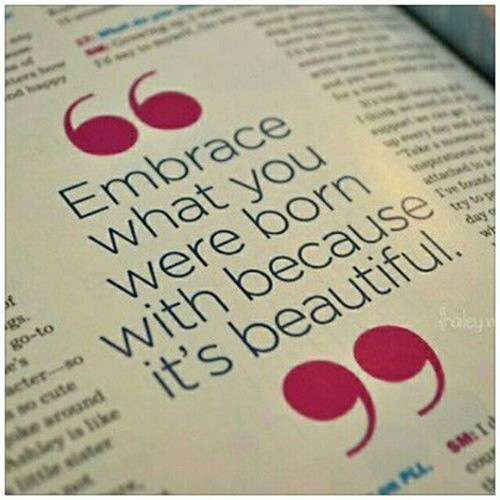 Embrace Yourself for who you are and what you were born to do.